We model this process step by step, then create calendars and configure the Business Process simulation, which is simple enough to be calculated with pen and paper. After that, we run the simulation to compare that result with the pen and paper analysis. Create a BPMN2.0 Resource named Support. Create a BPMN2.0::ResourceRole inside Service Customer, give it the name support and set the tag resourceRef to the name of the Resource element Support. Looking at this result, when resource constraints are applied the computation is very complicated for such a simple model. Now we will see how EABPSim can help. In this section, we first create the Calendars, then set up the Duration and Start parameters. For element parameters, you can specify one or more calendars for a given parameter. However, if any calendar is set for a parameter value, a default value (without any calendar specified) must exist, otherwise the simulation won't work. Clicking on the button on the Configure BPSim window toolbar will automatically check this constraint for you. Click on the 'Calendars' tab, click on the New button to display the 'Event Recurrence' dialog and complete the fields as shown to create a calendar. Click on the OK button and overtype the Calendar_n text with a name for the calendar. Create two calendars. Click on the 'Scenario' tab. In the 'Activity' group, click on Service Customer and click on the 'ResourceRole' tab. Check that the 'Resource SelectionExpression for Activity' panel shows bpsim::getResource('Support',1) as an expression. This expression is loaded from your BPMN model by default. You can do some advanced configurations for resource selection for a task. A file with the name Calendar Based Support Process Simulation - Result is generated. This report file contains the result for a weekday simulation. 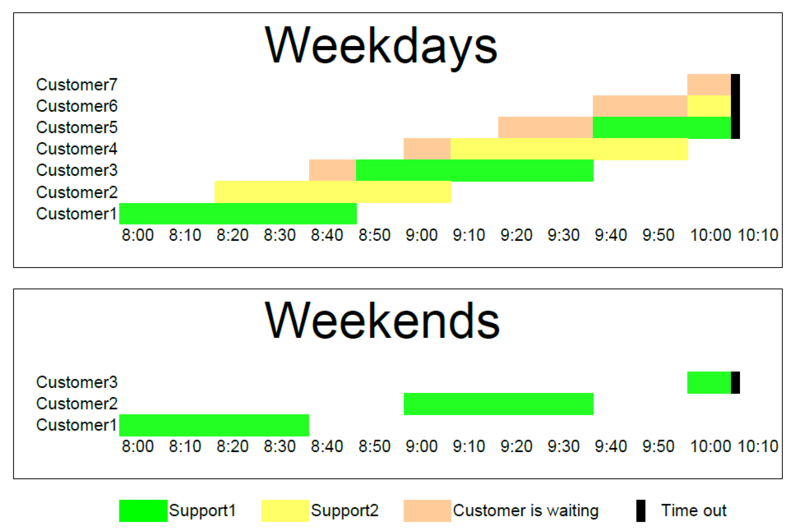 The Calendar Based Support Process Simulation - Result file is updated to show the result for a weekend simulation. In each case, check the match between the result file and our analysis with pen and paper.